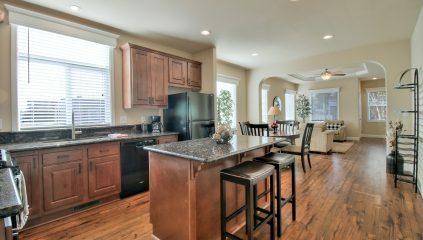 Alliance Homes is proud to introduce the Carmel, a gorgeous light-filled 3 bedroom, 2 bathroom home. This captivating home has loads of character and features a unique split floorplan that offers plenty of space and privacy for everyone, warm and inviting rooms, and generously sized living spaces. Interior features include 9’ flat ceilings, crown molding, recessed lighting, programmable thermostat, and gleaming auburn hickory wood laminate floors. The island kitchen showcases granite countertops, Whirlpool appliances, high-end mission cabinetry, and a pantry with double doors. On one side of the home, the two bedrooms have large closets. Towards the rear of the home, the master suite features a spacious walk-in closet, his and her sinks, soaking tub, and a walk-in shower. Looking for more design ideas or considering the purchase of a brand new home? Tour the design center to browse our wide selection floor plans, countertops, paint samples, and finishes. For more information, please contact us at (866) 494-8993. 2018 Skyline Serial #: 2G700482KA/B HCD #: DL1164796 *This is a model home located at our display center. Current price based on this exact model placed in mobile home community. Price subject to change based on final placement of home. *List price excludes closing costs & escrow fees. *Information deemed reliable, but not guaranteed.